Downhill is a niche segment in the inline skate industry, making it often hard to find good equipment, so it’s with great pleasure that we’ve welcomed the new Seba 995 aka Downhill frames. Here’s a slightly customised Seba FR1 skate with these frames. The frames are amazing : Light, stiff and the finish is incredible, similar to the Deluxe frames. The only negative point is to see them be so high, at 53mm when the lowest possible 90mm wheels frame would be 46mm, but this is due to the 2nd wheel being right below the front mounting holes, so 3 millimetres are for the frame’s thickness and 4 more are for the bolt’s head. Skating with these, the height isn’t an issue. The weight is quite noticeable, but it’s largely due to having five large wheels, not to the frame itself. The sensation is like being on rails, the skates are just so stable, and even on the lightest downhills, it feels like the skates are just going to keep accelerating forever! It’s clear that these frames aren’t for everyone, but downhill addicts with plenty of practise now have some easily available frames for their discipline. If you’re from Brazil, you should try online skate shops, starting with USA ones. Good luck! Hi – I have FR1s, (with an 84mm Powerslide frame) the liner needs replacing & seeing you’ve used Seba High liner here wonder if they are an improvement? I was hoping they could fill the shell out/ hold the foot better & give a bit more control – what’s your opinion on them? 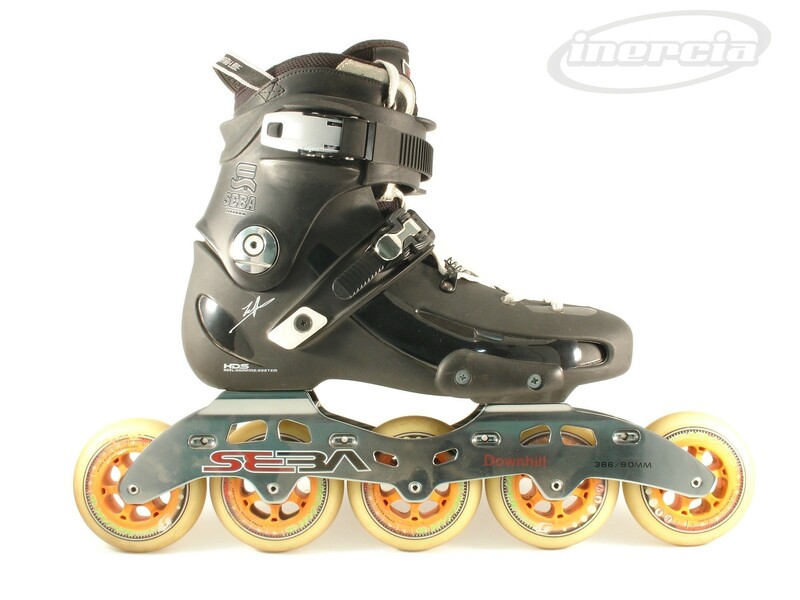 The Seba High liners aren’t as high at the ankle, so I wouldn’t recommend them for an FR shell. Here I used them because those are FR1 from the very first batch, and they had very basic liners. At the time, the only easily available after market liners available were the Seba High. All of my more recent FR customs (and even a few Twister customs) use the FR liners, as I really like those. Thanks for the reply, so it was just be default then. Are the balance liners thicker, more space filling or just a bit higher spec construction/ materials?